Many people are finding second careers in the pet care industry, many of which becoming dog groomers. It is important to know what the average dog groomer salary is in the US. The obvious appeal for a grooming career is the ability to work with animals on a daily basis. Often times it is not enough to just work with animals, it is important to make a comfortable living too. Find out below how much income potential there is for dog groomers. How Much Do Pet Groomers Make? According to an independent study done by payscale.com, the average dog groomer salary in the United States is $29,848. This means that some dog groomers make more, and some make less. On the low end you have your introductory groomers making roughly $17,000. On your high end you have your experienced, established dog groomers making closer to $50,000 per year. Note that these numbers are for the average dog groomer salary and they don’t include tips and bonuses. 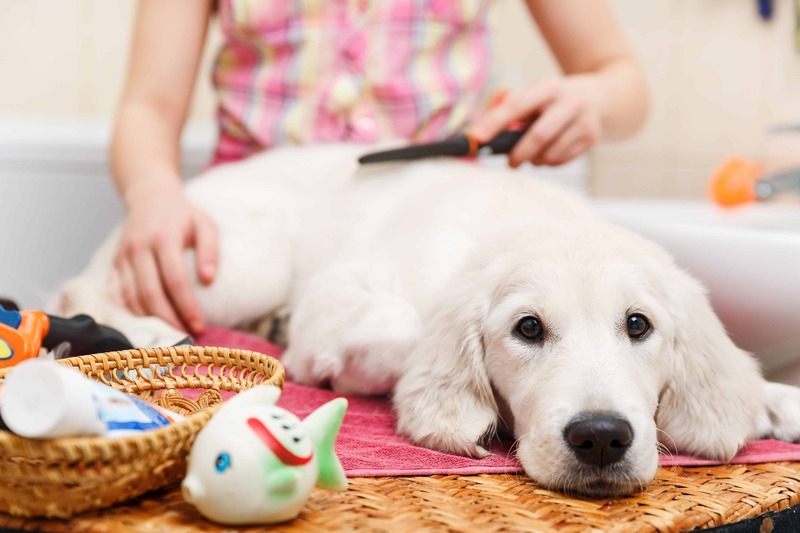 Tips can be a significant portion of a dog groomers income. Statistics show that established groomers can make up to an additional $4.26 per hour in tips alone ($8,860.08 per year when working 40 hours per week). As a dog groomer, you will come across two different pay structures and it is important to understand each's benefits. U.S. grooming salons have traditionally used a commissioned pay structure. These businesses pay their dog groomers a commission per dog they complete. The commission usually ranges from 30% to 60%, with the average being around 50%. The percentage of the commission alone doesn’t determine how much you will make. There are some salons paying out 30% commissions and their groomers are making $15 per hour, whereas, another salon pays 50% and their groomers are making $12 per hour. Other factors include: the average groom cost, how long each groom takes, and if you bath your own dogs. The second structure, which is becoming more popular with grooming salons, pays a stable wage to their dog groomers. At these salons, the average dog groomer salary is usually based on speed and efficiency. Such a pay structure is usually found at salons that have higher capacitie. Because of this, they are more interested in having stable dog groomers and they can afford to pay you even on slower days. The benefit to you is a stable, consistent income that doesn’t fluctuate based on seasonality. If you would like to become a dog groomer, the best place to start is by attending a dog grooming school. The benefits of this include the ability to receive comprehensive, hands-on education, and a certificate that is recognized in your industry. Most hands-on schools also help with job placement and already have a network of businesses that hire their graduates. If you’d like to learn more about how to become a dog groomer, give us a call at (636)489-5356 to schedule a school visit!